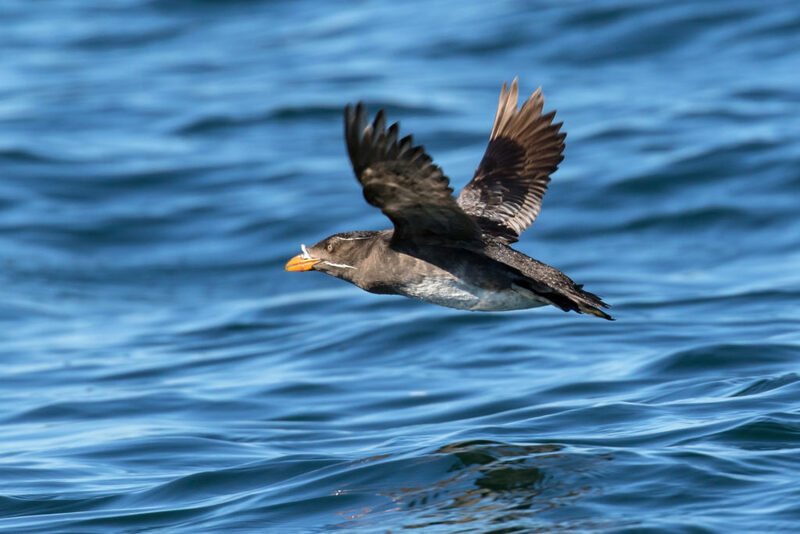 Our partner Henley Spiers reflects on his recent trip to the George Town Harbour Hope Spot! 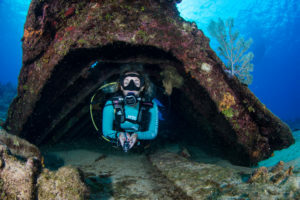 I recently returned from Grand Cayman, home of the George Town Harbour Hope Spot and a place which has long been on my diving bucket list. For tourists, these islands are a stress-free haven of sunny white sand beaches and clear blue waters. Beneath the surface, however, a war is being waged over the future of this tropical paradise. George Town Harbour may be home to some of the most famous and accessible reefs around the island, but a project to build a new cruise ship pier threatens to decimate this underwater ecosystem. Cruise ship passengers numbers worldwide have grown a massive 60% in the last 10 years. In the Cayman Islands, cruise ship visitors (1.72 million in 2015) far outnumber visitors coming by plane (385k). In addition, growth amongst the cruise ship visitors in 2015 (6.7%) exceeded those by plane (0.7%). Understandably, the Cayman Islands government wants to get its share of the cruise ship pie. The latest and biggest cruise ships are the Oasis class, designed for over 5,000 guests. At present, the cruise ship companies have stated the Oasis class ships will not include Grand Cayman in their itinerary, due to a lack of proper facilities. The Cayman Islands government wants to ensure they can accommodate for these ships and secure a long term future for cruise ship business in the islands. They are pushing forward with plans for a new pier and currently figuring out how to pay for the project and agree on a design plan. The construction of the pier as well as the dredging required to accommodate the Oasis class ships will have a devastating impact on the reefs in the harbor, and quite possibly those in the surrounding area too. Ironically, these reefs are most popular amongst cruise ship passengers due to their proximity and easy accessibility. I set off to have a look around the reefs for myself- I found some good, some bad and some ugly. 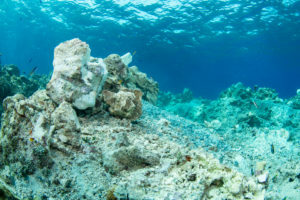 Being in close proximity to the capital city and heavy boat traffic, it’s no surprise the coral reefs in this area have suffered from various types of run-off. 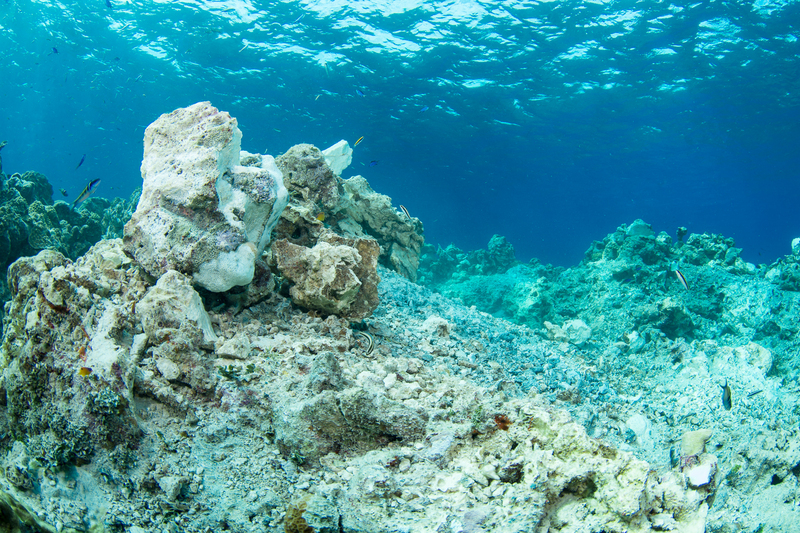 Human waste in particular has contributed to micro-algae forming and settling on much of the reef. Eden Rock is home to spectacular swim-throughs and huge resident Tarpon, but I also found massive dents in the top of the reef where a cargo ship recently collided with it. Some people clearly care, as I found divers clearing the rubble before trying to regrow the coral, just as they have done at the site of the Carnival Cruise ship collision in 2014. We also dived the wreck of the Balboa and I found it to be the best site in the area. 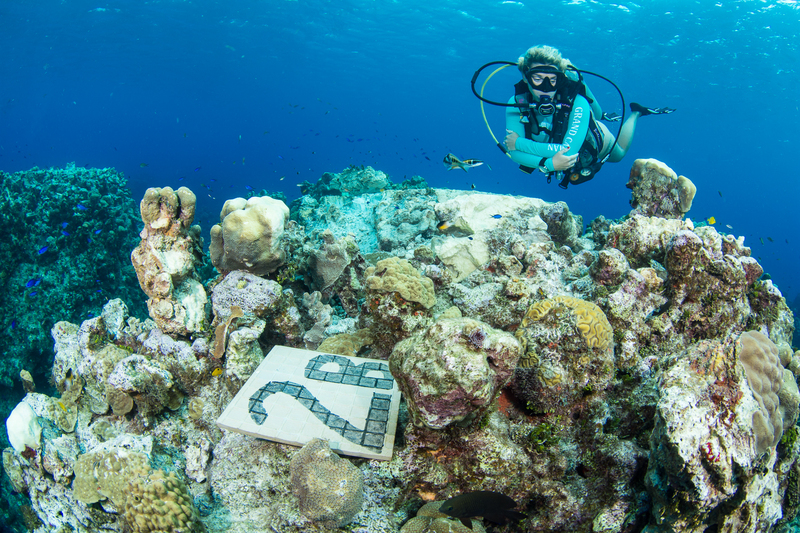 Sunk in 1932, she is broken up across the dive site and fully encrusted with sponges, coral and sea fans. 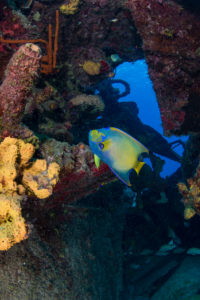 Queen Angelfish hid in the nooks and crannies and a big grouper patrolled its territory. The proposed cruise ship dock would cut straight through the Balboa and there has been talk of migrating it to a new spot – I cannot fathom how that would be possible without causing massive damage. 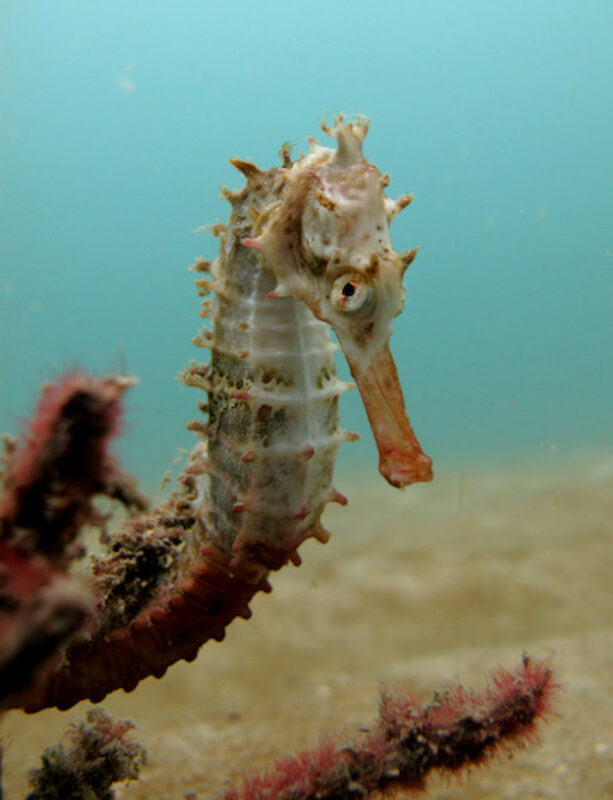 Whilst it is not a pristine underwater environment, it is nonetheless a valuable asset for Grand Cayman. It would be a great shame to lose it and I worry that an environmentally destructive project would set a dangerous precedent. Furthermore, the Cayman Islands would be ‘shooting themselves in the foot’ if one of the most popular tourist attractions in the area is destroyed in a bid to attract more visitors. Ironically, the George Town Harbour snorkeling and dive sites are most popular with cruise ship visitors due to the ease of access. The topography of this area is unique in terms of providing easy, shore diving opportunities and there is no clear plan B in terms of where to divert marine tourism if construction goes ahead. Furthermore, a new pier doesn’t necessarily hold the key to securing cruise ship business. The Oasis class ships could still be anchored and use a tender service to access shore. Indeed, the Carnival fleet are sending their biggest ship to date, the Carnival Vista with a 4,000 guest capacity to the island despite the lack of a cruise ship pier. Though the number of cruise ship visitors is impressive, their average on-island spend ($86 US) pales in comparison with overnight guests ($246). Additionally, the islands infrastructure is struggling with the existing tourist load and the most popular attraction, Stingray City, is at capacity. In sum, there are many impacts and questions surrounding the project which remain unanswered. Alongside the proposed pier development, another concerning event is occurring around the corner from Stingray City on world-famous 7 Mile Beach. Arguably the crown jewel of Grand Cayman’s tourism industry, this beach is a protected area where development beyond the vegetation line has long been banned. However, in my first week on island, the government granted permission for a trial excavation of beach rock in the area. Within hours, work was underway by Dart Real Estate to excavate the trial area then proceeding along half a kilometre of the beach. The Department of the Environment opposed the project and similar proposals have always been rejected in the past. No one can be sure of the impact but having inspected the area, coastal erosion and impact on turtle nesting areas are the greatest concerns. Between the George Town Harbour pier and the excavation at 7 mile beach, I am concerned the Cayman Islands Government is setting a dangerous precedent which will be regretted by future generations. The cruise ship companies and Dart Real Estate are businesses, measuring success in terms of year-on-year financial growth. If you are in their position, you can build more ships and you can buy more land. The land and natural resources available to the Cayman Islands are finite, growth to the detriment of the islands’ social and environmental assets is a false economy. 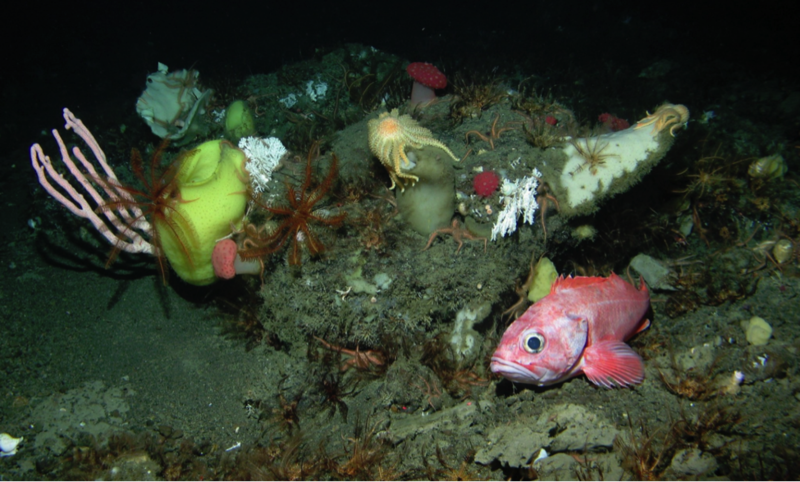 These underwater assets, once destroyed, cannot be rebuilt. This is irrevocable change. The greatest leaders in our history, the likes of Martin Luther King and John F. Kennedy, are remembered for their foresight and stubborn refusal to wave from doing what they believed to be right. I urge the Cayman Islands Government to think carefully before moving forward with these projects and to consider how they will be viewed, not just by the Caymanians of today, but of tomorrow. Many thanks to Charlie Todd and Tom Shropshire of Off the Wall Divers for the underwater tour of the George Town area. Humans have inhumanely killed off many of our innocent endangered animal species on our precious earth, so it doesn’t surprise anyone with what is and has been going on in our beautiful oceans!!! This greed must stop or be stopped immediately or there will be no animals or oceans left as there is a specific order in the food chain of the earth’s and ocean’s inhabitants. What does it take to get these morons to understand this??? People of all countries must stop purchasing and eating animal parts when they are abused or killed over someones greed!!! This is deplorable and shame on all of those who participate in the capture, killing and eating of animals to the extent of extension!! There is absolutely nothing cool about laying a highrise hotel on its side and calling it a cruise ship. You miss the entire experience of the ocean and is completely greed driven. 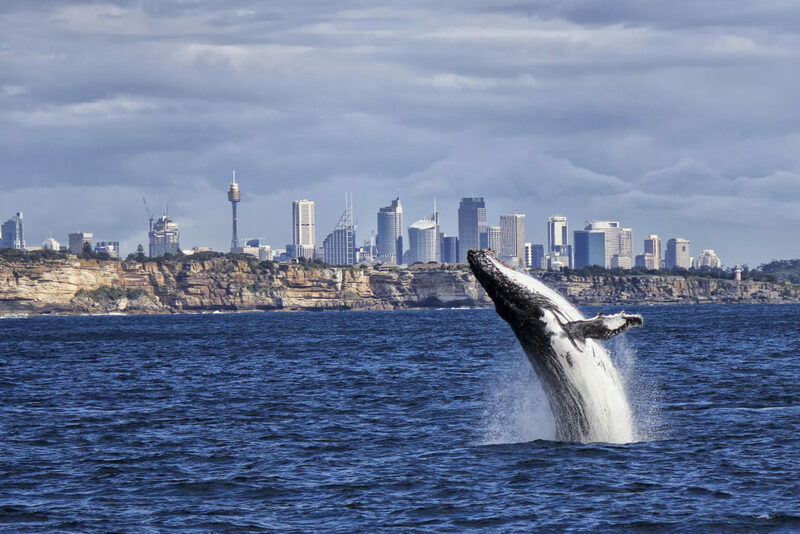 Beside that, they are an eyesore of the first magnitude and why anyone would want that thing blocking their views of the ocean and nature and would sacrifice their reefs to accomplish it is idiotic, though obviously not to the cruise ship companies. Your observation is spot on “.. the Cayman Islands would be ‘shooting themselves in the foot’ if one of the most popular tourist attractions in the area is destroyed in a bid to attract more visitors. Ironically, the George Town Harbour snorkeling and dive sites are most popular with cruise ship visitors due to the ease of access. “. Unfortunately, there has not been any new details on how reef damage would change with the plan to move the pier to deeper water.